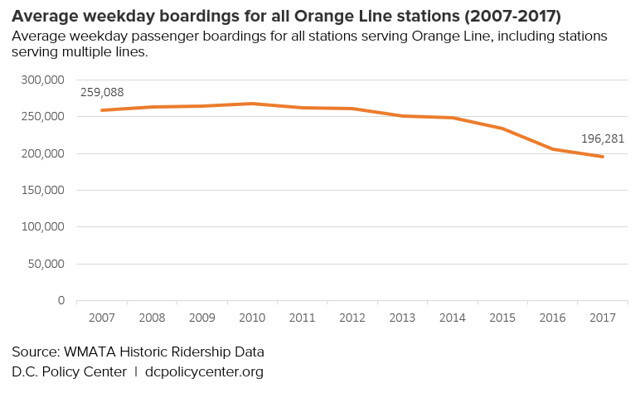 The Orange Line is perhaps the most sensitive to service problems: even small delays can make getting from Virginia, especially if one is making connections, far more difficult. And Virginia has always been the most difficult state partner to wrangle when it comes to budgets. This is not helping. For my commute, the absurd 45-day red line shutdown led me to finally try MARC. On a monthly pass I pay less than $3 per trip. I always have a seat and have only had one delay of a few minutes. It means i walk an extra ~2km per day from Union station to work and back, but there is a shuttle for bad weather days. When red line service is restored, I will continue riding MARC. So sick of the crush, the broken escalators, messed up train cars, ‘train out of service’ repeated fifty times with flickering lights, etc. I already use uber on weekends instead of metro for family outings; it’s more convenient and still manages to be cheaper most of the time. I like the idea of metro and I want it to succeed. I’m willing to tolerate a lot of inconvenience. If even I am unwilling to stick it out at this point, how is metro going to pick up new riders?